I’m working on my eighteenth book right now and there’s this thing that happens every single time. Every single time, I forget how hard it is. I think once I type “the end” I tend to forget the blood, sweat, and tears that go into each book! But I’m in the spot now that I’ve been in so many times before, where my brain feels way too full of details and I don’t sleep well. When I start to get toward the end, I find it hard to really rest well because there are (fictional) conversations going on inside my head and I’m thinking about how a scene should or shouldn’t play out. But with Grant Ward, the male point of view character in my upcoming release A Reservation for Romance, I’m being a little tougher. Grant is a little different than most of the heroes I’ve written in the past. He’s in his thirties and has had a good bit of life experience. He’s not a young guy just starting out. And I think that life experience impacts his interactions with the heroine, Brooke Lockwood. Grant is not as likely as a younger, more inexperienced guy to think things will work out based on a feeling or only be attracted to a pretty face and cute figure. Widow and single mom Brooke Lockwood knows it’s time to move on with her life. She can’t let fear hold her back any longer. But when her attempts at dating don’t go well, Brooke all but gives up. She’ll just be the extra wheel on her family’s upcoming vacation. Grant Ward runs Brooke’s favorite coffee shop, and she’s known him since elementary school. He was even friends with her late husband. Grant returned to Arcadia Valley after suffering a tragedy of his own. When he learns of Brooke’s plight, he has a solution: if she’ll go with him to his brother’s wedding, he’ll go on vacation with her family. It’s the perfect plan until the sparks between them begin to fly. Can Brooke and Grant let go of the tragedies of the past and the fears of the present and make a real reservation for romance? And now I’m curious: Who is the most (or one of the most) memorable male character you’ve ever read? What made them so memorable? I think one who sticks out for me is Rhett Butler. I still remember reading Gone With the Wind the first time and being utterly devastated at the end. Hi Annalisa, thanks for sharing about your new book- it sounds great. I like a male character who also gets to develop alongside the heroine, so Grant sounds great. Hmm, most memorable male character would have to be Moshe Sachar from Brock and Bodie Thoene’s Zion Series. Hi Annalisa. Thanks for sharing Grant and your new book. One of the most memorable male characters was Canadian windsurfer Jordan Haines in Carol Moncado’s Heart of a Prince. Jordan had a heart of compassion for a weary Crown Princess Astrid. As a care giver, his heart tugged on my heart strings. Such a compassionate man is seldom seen in fiction or life. 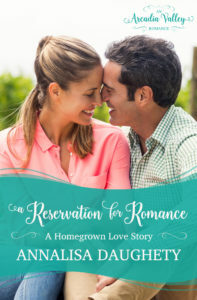 Looking forward to reading A Reservation for Romance. Best wishes and Happy Writing. I don’t have a favorite. I enjoy whatever I’m currently reading. Your new book sounds interesting. I’ve enjoyed the Arcadia series. Your new books sounds like a must-read. :) The first name that popped into my mind when you asked about memorable heroes was Marcus from the O’Malley series. His strength of character, passion, and pretty much everything about him is memorable. Tough question! So many stand out for me….but I am going to go with Rob Santoro from Valerie Comer’s Other than a Halo. I look forward to Brooke’s HEA!! I’m looking forward to your book! I know Rhett Butler does tend to stand out. I’ve read so many books, it’s really hard to pick one most memorable. The most memorable hero I ever read was Colin Brockman in Deb Kastner’s The Christmas Groom. It was one of the first Love Inspired titles I’d read. He’s memorable to me because he’s not really hero material. He’s scruffy and late all the time. But Deb gave an endearing reason for why he’s like he is. And the major thing–he’s blond. I’ve never been attracted to blond men. It’s always the dark-haired, olive skinned guys that I notice. But I fell for Colin anyway because he was adorable. I still haven’t been brave enough to try writing a blond, non-hero. I had a good laugh over that, Shannon. I am SO not attracted to blond men. I have this dark-hair, blue-eyed thing going that would be every one of my heroes if I let it. For me, it’s much harder to write a blond hero.